If you could, please click the Stumble Upon icon on the sidebar to the right. I appreciate it. Thanks! More than 20 billion pounds of rice is produced each year by farmers in Arkansas, California, Louisiana, Texas, Missouri and Mississippi. The US produces high-quality varieties of short, medium and long grain rice, as well as specialty rices including jasmine, basmati, arborio, red aromatic and black japonica, among others. Look for the Grown in the USA logo on packages of 100-percent U.S.-grown rice. The logo identifies rice that is grown and packaged in the US. Rice storage, uncooked milled rice (white, parboiled or pre-cooked)... If stored properly, milled rice will keep almost indefinitely on the pantry shelf. Once opened, rice should be stored in a tightly-closed container that keeps out dust, moisture and other contaminants. Whole grain rice (brown, red or black)... Because of the oil in the bran layer, this rice has a shelf life of approximately 6 months. Refrigerator or freezer storage is recommended for longer shelf life. Cooked rice may be stored in the refrigerator for 3 to 5 days or frozen up to 6 months. USDA recommends to cool to 70 °F within 2 hours and from 70 °F to 40 °F within an additional 4 hours. Hold cold rice at 41 °F or below. How do I heat rice after it is refrigerated? For each cup of cooked rice, add 2 tablespoons liquid. Cover and heat on top of range or in oven until heated through, about 5 minutes. In a microwave oven, cover and cook on high about 1 minute per cup. Frozen rice may be cooked 2 minutes on high power for each cup. Fluff with fork. Should I rinse my rice? US grown rice does not need washing or rinsing before or after cooking. Rinsing may wash away nutrients. What is wild rice? Not a true rice, wild rice is the grain of an aquatic grass native to North America. Today most of what is sold as "wild" rice is actually cultivated and then mechanically harvested and processed. Awards... I received two awards. I'm happy and honored. Thank you, http://paperplatesandchina.blogspot.com. Thank you both for thinking about me. Cook rice according to package directions. In skillet heat olive oil over medium heat. Add chicken, season chicken with salt, pepper and steak seasoning, cook about 5 minutes, turning once. Remove chicken and place on plate, keep warm. Add onions and bell peppers, season with salt and pepper, cook until tender. 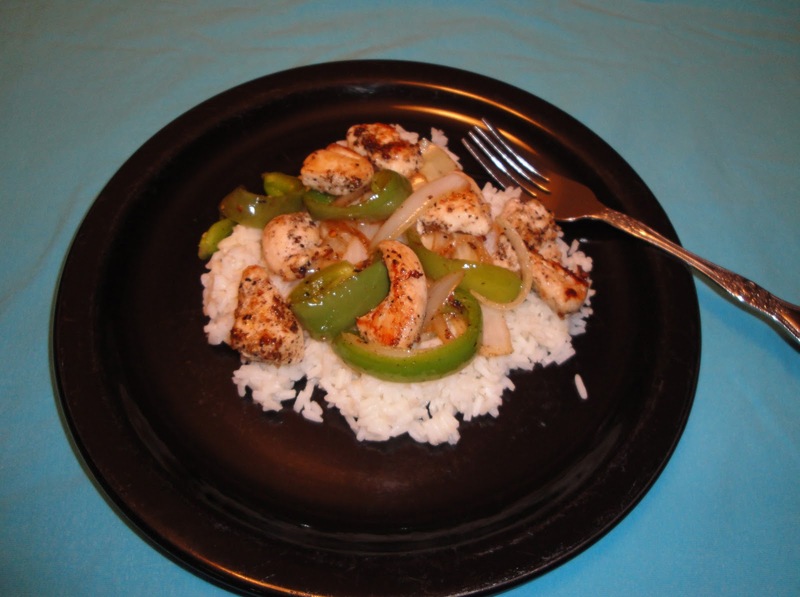 Place cooked rice on dinner plate, add chicken, onions and peppers. Enjoy! Sounds like a fabulous dish, Christine! I would absolutely love a serving. Rice is a great addition to so many meals! This is a delicious and healthy-looking dinner!! I hope you have a great week too. Thank you! Sounds like a great simple dish...I eat rice nearly everyday. I love rice. My daughter likes plain but the rest of us like fried or wild. Great post as usual. I loved this rice because it has chicken as well as bell pepper. My kids would love this!! Red Rice, really? You are a wealth of information Christine; thank you. I'm happy and honored to accept the award. Thanks! Simple, and delicious chicken and rice dish! Very tasty and perfect for busy days. I love this combo! If I made this, I'm sure there wouldn't be any leftovers. I also clicked your stumble upon button! Being a number one fan of rice, I am drooling over your recipe. Besides the healthy types or rice like brown ones, basmati is another best choice. I cook this at home as its best for my hubby and his diabetic. Chicken and rice are major staples around here, so I am glad to see your recipe. Nothing like a well rounded and simple dish for busy days-well done! It's always nice to have begetarian recipes in our cook books. Simple yet satisfying and quick enough for those rushed evenings when everyone is coming in and going right back out again. Thanks for sharing. Great post, Christine! I'm always surprised at how many people don't know how much rice we grow in America, and how easy it is to cook. Recipe looks wonderful! Rice I have bought recently in Central America - needs picking over. Such a pain! I have found little stones in it. Eek! My husband loves rice so much. Fortunately, it is also gluten-free - however, not low-carb. I eat rice, but not a lot at a sitting. Nice easy, tasty meal. Have a great day. Sounds so simple to prepare yet so delightfully filling! Love recipes like this! great idea of a dish when I have some cooked rice left in the fridge and quick to make! Thanks for clicking stumble upon button! I appreciate it. Sounds delish, Christine! This is a perfect weeknight dish! I love rice and recently started enjoying brown rice. Take a bit longer to cook, but the nuttiness is absolutely worth it! Looks delish! Thats crazy how much rice is produced! Sounds really good! And once again, I love the history you always include! If you try this let me how what you think. I love to hear any feedback. Thanks! Great info on rice. I never thought about adding a little water when re-heating it. Thanks for sharing a simple and delicious sounding recipe.